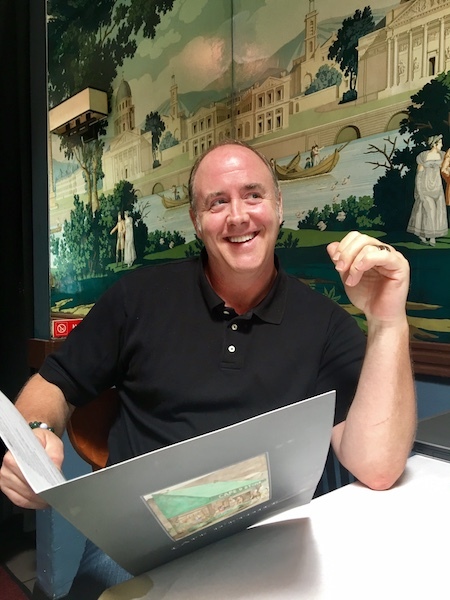 It takes Tom Doherty, 51, a really, really long time to tell me what he would order if he were dining in his very own restaurant, the WeHo institution and French-themed Café D’Étoile. “I’m really having difficulty,” Doherty admitted as he scanned the menu. Okay, cool. But what would you recommend? Uh-huh. And you would have the…, what’s that now? What to do? “Like if a new patron walks in and asks what they should order for dinner on a warm summer evening?” I prodded, hoping I was helpful. And for an entrée? (Concentrate, Tom. Look at your menu.) Doherty sighed, “It’s really hard to sift through because there isn’t anything on the menu I would not get.” Fine. It’s all good. Diners can order whatevs and walk away satisfied. Perhaps a lot, but Café D’Étoile now has 24 employees, quite a few of whom have been with Doherty for over 20 years. When asked why he thinks that is, Doherty replied, “When [people] find something decent, they want to stay. In addition, I’m not a trigger happy guy.” Translation: he’s created a good place to work – and he’s an awesome guy. Café D’Étoile, the Great Equalizer? Vive la difference. Celebrities are no strangers to Café d’Étoile. Sitting in the opposite corner from Doherty and myself when we conducted this interview was Rachel Lindsay of “The Bachelorette”. Doherty said she comes in for lunch now and again. She sat with Cary Fetman, her “award-winning dress designer,” according to Doherty. Husband Rick, a software salesman, and Doherty met 19 years ago when Rick was a customer who traveled down from San Francisco for work. Married for three-and-a-half years, Doherty told me, “Koa wood…it means bravery, strength, all of this very manly [stuff].” Does he relate to that? “It sounded pretty cool,” he admitted. Doherty ultimately, I think, just maybe, decided what he would recommend for dinner. “The sea bass is outrageous,” said Doherty. “Somebody came in yesterday – it’s a beautiful piece of fish – ‘You know what I want? I want a piece of sea bass on a burger bun with that fresh tartar sauce you make.’” Doherty shrugged. The guy ended up paying $37 for a fish sandwich. 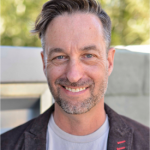 But if that’s what the customer wants, again, Doherty: “Do what you gotta…sh—t like that is the best.” You know, on a warm summer evening in WeHo. 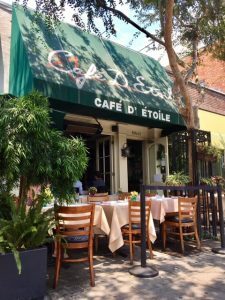 CORRECTION: An earlier version of this story identified the celebrity dining at Cafe d’Etoile with designer Cary Fetman as “Scandal” star Kerry Washington. According to Fetman, he was dining with Rachel Lindsay of “The Bachelorette”. The story has been corrected. I meant no disrespect. Patrick and I are still friends and email often . While I like the restaurant with its very moderate prices, I still lament the loss of the Garden District and the Carriage Trade plus other restaurants which catered to a gay male clientele. But those days, unfortunately, are over. Great restaurant, great food and the nicest staff.. Tom is a gentleman. it is a landmark business in weho but was a success even before the current owners. while i appreciate that any business needs a refresh and new blood, to call the restaurant a ‘sh@% hole’ is a bit crass and ungrateful. when tom took over, there was a a steady clientele and a lot of good will. the previous owner was a lovely man who loved his customers and staff. and is not deserving of such a unnecessary criticism. hey tom, your bathrooms are still ‘gas station’ quality. oh and by the way when liza with a z shows up at the bar one afternoon like she once did on her way to an aa meeting, then talk to me about celebrities. Hank, we need more wonderful stories like this one. We love Tom and Rick. It has been there a long time now but I personally preferred the “Greenery” which was once a very popular restaurant ga people flocked to for breakfast, unch & dinner. Great after hours hang out! Love me some Tom and his delicious Cafe d’Etoile! Over the many years I’ve been a patron, I’ve enjoyed several memorable birthday dinners there. 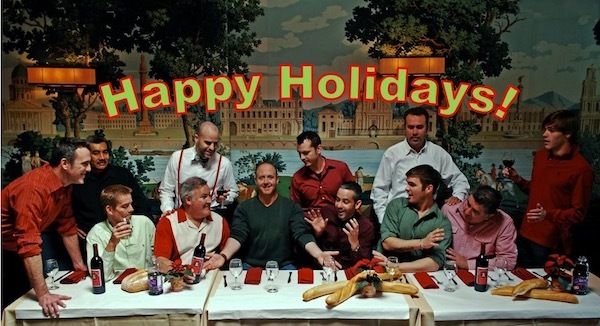 And always, always, always, Tom and his terrific staff have made my dining experience delightful. I’m thrilled to have it as one of my neighborhood restaurants. The reason the cafe is a jewel is because of this guy… the owner, Tom! He keeps it running like a top. All his staff are amazing, as well. We have celebrated major milestones with prime rib or sea bass with a martini. We’ve come here for a simple lunch with the southwestern club and fries with a beer. And, we’ve stopped by for a crab appetizer and a glass of wine. Thanks Cafe d’Etoile! Darn it Leslie K, you beat me to it……Agreed. its a gay Cheers! Wheee everybody knows ur name. Tom is a great guy, community oriented and a great friend. Be there at 7! Love this story! The Cafe is successful simply because my brother Tom is an amazing man who just loves people and good food! Tom asks why the restaurant is so successful. Clearly it’s because Tom and the people who work for him make it so inviting. The food is almost secondary. Love Cafe d’Etoile! Tom is a great guy, the staff is wonderful and the food is good! Very thankful we have this neighborhood gem! GREAT article about a Great restaurant and even better restaurant owner!! A little surprised that I’m not featured in the piece though, lol. Quite fond of this restaurant. I’ve been dining here for well over 20 years.